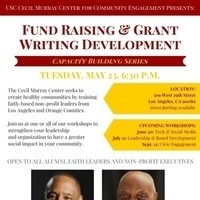 The USC Cecil Murray Center for Community Engagement seeks to create healthy communities by training faith-based non-profit leaders from Los Angeles and Orange Counties. The Capacity Building Series are one-off workshops open to the public and directed to Murray Center alumni, faith leaders and non-profit executives. Rev. Cecil Murray and Rev. Mark Whitlock, who brought $400 million into South L.A. through FAME Renaissance, will teach the first session on fund raising and grant writing development. Join us at one or all of our workshops to strengthen your leadership an organization to have a greater social impact in your community.